Primary neurons and glia from developing rat cerebellum on Ferentis collagen mimetic peptide hydrogel (left) and tissue culture plastic. 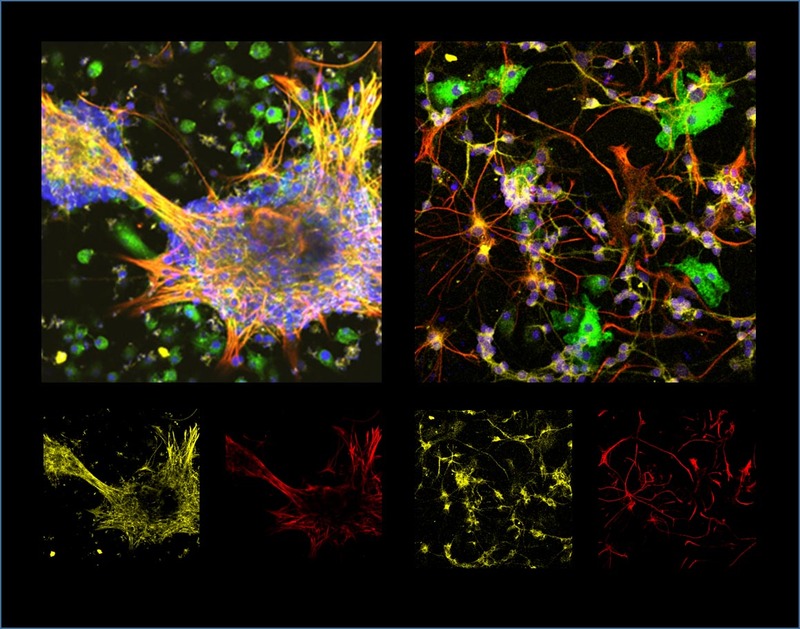 Neurons are immunostained yellow for microtubule associated protein 2, astrocytes - red for glial fibrillary acidic protein, microglia are marked green with fluorescent isolectin conjugate, and blue are all nuclei stained with a DNR binding dye Hoechst33342. 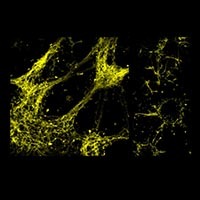 Small images below are to separate neurons from astrocytes that merge to orange structures when are localized close together. 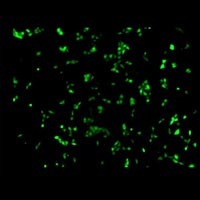 The cells form 3D spheroids on Ferentis collagen mimetic peptide (CMP) hydrogel that communicate with neurite fibers supported by alongside distributed astrocytes. The spherical bodies are actively shaped by microglia which are selectively removing synapses, neurites and entire neurons. This is mimicking in vivo tissue formation process. 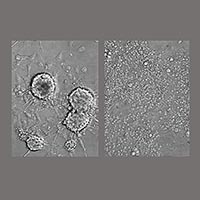 The same cells make more static monolayer on cell culture plastic surface with less neurites, not so tight contacts between astrocytes and neurons, and visibly flattened microglia. Cells were visualized under a laser scanning microscope Zeiss Axio Observer LSM700. 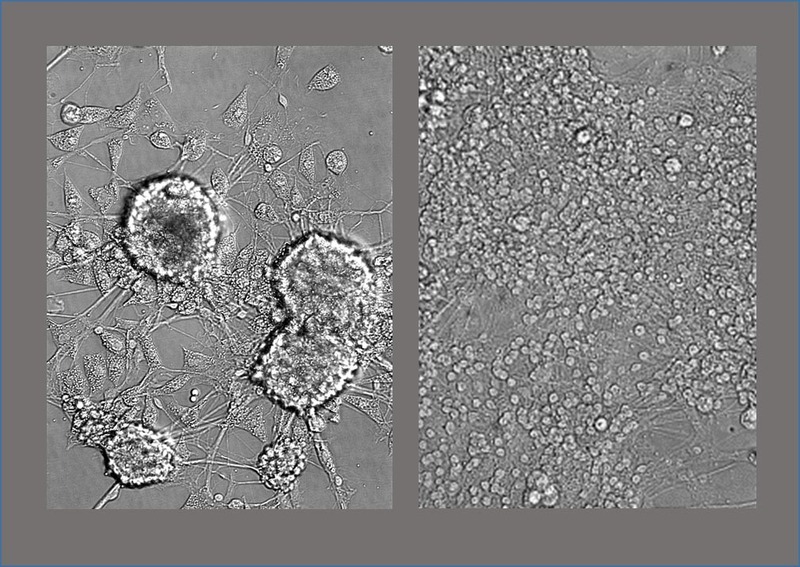 Primary neuronal-glial cells on collagen mimetic peptide (CMP, left image) and CMP with hyaluronic acid (HA), right, after 5 days in culture. 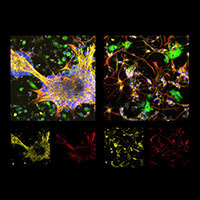 CMP induced spherical neuronal-astrocyte formation surrounded by microglia, and introduction of HA made cells adhere to the hydrogel surface. Phase contrast images made by Olympus IX71S1F-3 microscope. Introduction of IKVAV peptide sequence from laminin into CMP structure induced significant neuritogenesis (left) compared to neurons on plastic surface (upper right) and porcine collagen (lower right). 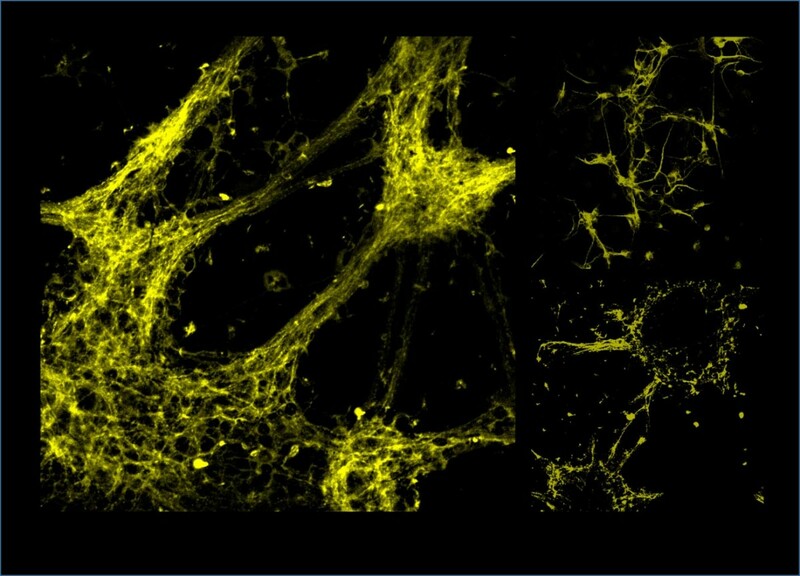 Neurons are immunostained yellow for microtubule associated protein 2 and visualized under a laser scanning microscope Zeiss Axio Observer LSM700.